Department of Homeland Security Kirstjen Nielsen addressed reporters Monday amid intense backlash on the Trump administration's policy of prosecuting immigrants crossing the border that has resulted in the separation of families. She blamed Congress for a supposed "loophole," calling on the legislative body to fix the issue, despite the fact that the situation has been spurred by the administration's decision to expand prosecutions. She argued that the Trump administration is merely continuing a policy from "previous administrations" that mandates separating a child who is "in danger, there is no custodial relationship between 'family' members, or if the adult has broken the law." Nielsen defended the administration's policy of separating children from their parents as the enforcement of the laws on the books. But the separation of families is actually an outcome of the Trump administration's increased prosecution of undocumented migrants under Attorney General Jeff Sessions' zero-tolerance policy that is driving up the number of families separated at the border. The children are separated from their parents while the parents are being prosecuted for illegally crossing the border. When families enter the country illegally, DHS may only keep children for 72 hours. While DHS continues to oversee prosecution of the parents after this point, their children then become the responsibility of the Department of Health and Human Services (HHS). Members of Congress from both parties have called for the Trump administration to end the separation of families. All five living first ladies, including Melania Trump, have come out against the policy. Nielsen claimed this policy is in place not as a deterrent to keep families of immigrants away from the border, as other administration officials have said, but rather as a means of keeping the children safe. "The children are not being used as a pawn, we are trying to protect the children," she said. She described the southern border as "functionally open" and "overrun by those who have no right to cross it." 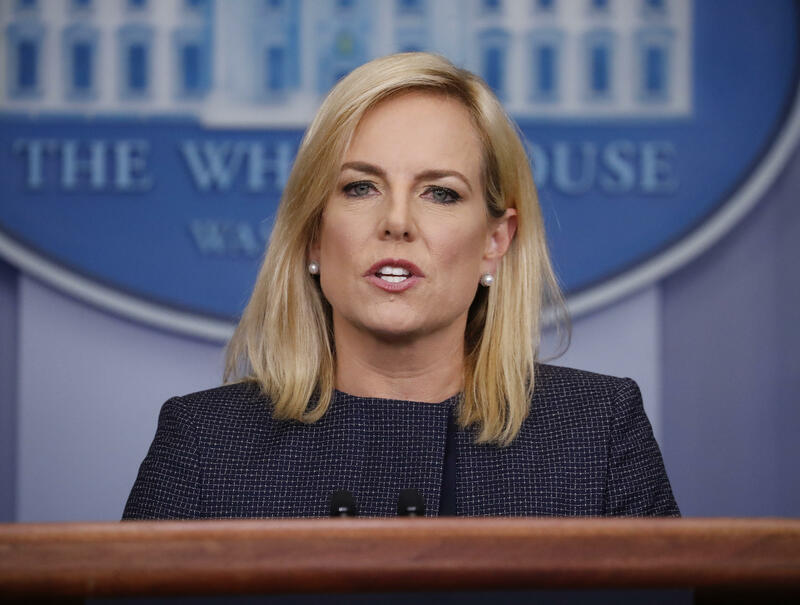 Nielsen called on Congress to reform the asylum seeking system, the United States Trafficking Victims Protection Reauthorization Act of 2008 and to pass legislation allowing the Trump administration to keep families together. The White House press corps was extremely skeptical of Nielsen's assertions, repeatedly asking why the president doesn't reverse the zero tolerance policy that has caused the separation. "If we close the loopholes, we can keep the families together," she said, adding that the administration has repeatedly called on Congress to do so. Nielsen argued that some children are separated from their parents when they fail to provide documentation proving the familial relationship. She also contested that a lack of a verifiable relationship could be a case of human trafficking. Earlier Monday, President Trump blamed Democrats for the country's immigration problems and said that "the U.S. will not be a migrant camp and it will not be a refugee holding facility." Nielsen ultimately said that the children in custody are well taken care of and that they may still communicate with their parents in some cases, but said that the separation policy is still necessary until Congress is able to change the law. "We have a duty to protect the American people and it's one that I take very seriously," she said.